But here is the copy on the Taster’s Choice envelope that caught my eye. I’m of two minds when it come to copy like this. The marketing-y, branding-y, PR-ish part of me knows that Taster’s Choice must have an important social media component to this promotion, and if they didn’t include that piece of copy, they would have missed a huge opportunity. How else are they supposed to convert instant coffee drinkers to their brand? How else will they galvanize their Nestle army into spreading the word? “You’ve given me no hyperlink to click!” is what this part of me yells. I’ve heard whispers of “real-time hyperlinks” coming to at some vague and scary future time. The idea is that with a little applied technology (a barcode for your smartphone to scan, say) non-online promotions could be easily linked to their online counterparts. But until that day comes, directions like this seem to be asking a lot of the audience. No, of course not. 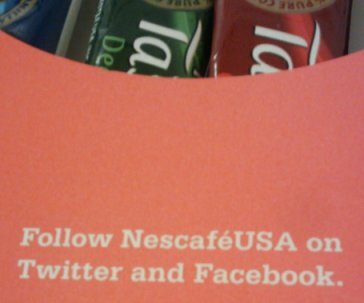 But there might be a little explanation, a reason for me to go through all the trouble to follow @NescafeUSA. For example, why not: “For updates on more free samples, look for us on Facebook and Twitter”? Maybe I’m overthinking; what do you guys think about urging people in meatspace to do something online?